In the mean time if I want to know where a picture was taken then I have a number of other options available, one of which is the new, award winning Qstarz BT-Q1000 Travel Recorder. Essentially this is a GPS datalogging device that records where you travel and then with the supplied software identifies where a particular photo was taken. This positional data is then saved in the photo file and can be used with a variety of location aware photo sites. 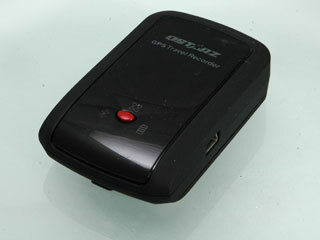 The Qstarz Travel Recorder is available from the UK distributors www.SuperGPS.co.uk at a price of £76 including VAT and delivery. The BT-Q1000 is pretty much the same size as most Bluetooth GPS receivers. It is well designed with a matt black body and a glossy black top panel. Qstarz have incorporated the Mediatek MTK GPS chipset into the datalogger and claim that the receiver will last 32 hours between charges. It also has sufficient memory on board to record up to 170,000 track points. Looking around the BT-Q1000: the device is about 2.5" by 1.75" by 0.75". As you can see above there is a mini USB socket on the side. This is used to provide both power and transfer data to a PC. On the other side of the datalogger there is a 3 way switch. This can be set to off, NAV or LOG. In the LOG position the BT-Q1000 just activates the GPS recording feature and saves your location to the data store every few seconds. 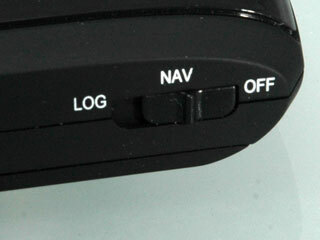 Setting it to NAV also adds Bluetooth GPS capabilities so you can connect a Phone, PDA or Computer to the datalogger and use it for navigation software as well. 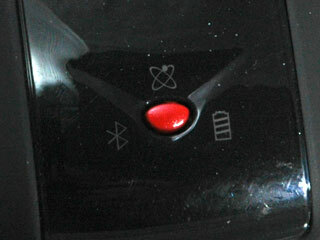 On the top of the Qstarz travel recorder is a red button surrounded by 3 indicators. The red button records a waypoint. If you want to identify a particular location, just press this button when you have a fix and it will be saved. The top LED is for GPS position fix. When it is solid the device is searching for satellites. When it is flashing it is recording track points. The left LED shows if you are connected to a bluetooth device. It does not light in NAV mode. The right hand LED indicates the condition of the battery. When it is charging it is green. In use it will not normally be lit, but will turn red when the battery is getting low. This brings us nicely to the power of the GPS device. 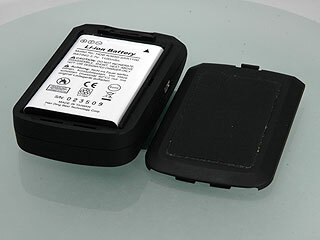 In the battery bay there is an 1100mAh Li-ion battery. One thing you may have noticed missing from the Qstarz BT-Q1000 is a connection point for a lanyard. Normally this might be regarded as a problem, but not with the Qstarz Travel Recorder as it is supplied with it's own travel pouch. Made of soft neoprene it has both a belt loop and a D ring for safely attaching it to either yourself, or as I do, my camera bag. The MTK GPS chipset is not of great significance to you as a user, but technically the MTK is one of the latest and most sensitive GPS systems. This means that the datalogger will work even under the most adverse conditions. This is important if you are in a forest with overhanging trees, or in a city with tall buildings. 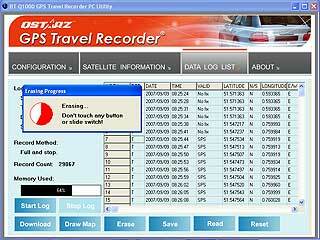 As I mentioned earlier the Qstarz travel recorder is not just hardware, but an entire workflow system. As there is no GPS embedded in the digital camera there is no capability to record the position where a picture was taken. 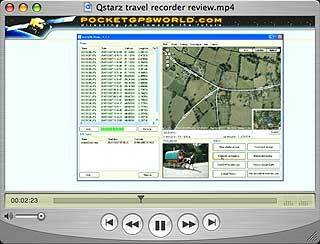 The Qstarz travel recorder system allows any digital picture to be "Geo-referenced". Each picture produced by a digital camera is typically in a .jpg format. The file data not only has the image but also a number of attributes associated with the picture. This adheres to a specification known as EXIF data, and typically includes such information as Camera Type, Image Taken date and time, Exposure, Flash, and other details. Although digital cameras rarely have GPS connectivity part of the EXIF specification is to save the position of the image. Now if you have an EXIF editor you could work out exactly where you took the picture and then edit the file manually. I doubt if that would work with more than a few pictures. I don't know about you but I will often take hundreds of pictures on a photo trip. I could never remember where they were all taken. This is where the Qstarz Travel Recorder comes into play. 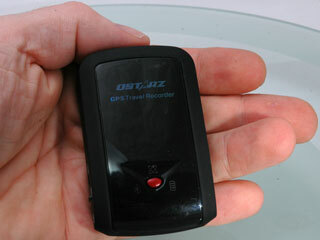 The Qstarz BT-Q1000 records your track as you move around saving a position point ever second. This has a time stamp plus the Latitude and Longitude. When you take a picture on your camera the camera writes the EXIF data including the timestamp of when the picture was taken. To accurately match your photo to the datalogger's track recording the data and time on the camera need to be set reasonably accurately. It is impossible to synchronise them exactly, but you should be able to get them to within a few seconds. When I take photos I always spend some time setting up and composing my images. This has the effect of allowing the position to settle down and the GPS to get a good fix before I start to take a picture. Any discrepancies in the time of the camera will then be eliminated. As a habit I generally have my camera's date and time set to GMT. This also is the time zone that the GPS satellites use, but you can use any time setting as long as it is consistent. So your pictures have been taken and you have got back home (or like me to the hotel) and want to quickly process the images. The first step is to download the TravelRecorder application. To do this you have to connect the BT-Q1000 datalogger to the PC (sorry no Mac compatibility) via the supplied USB cable and switch the datalogger to LOG. Although the Datalogger is bluetooth the BT interface is only used for navigation, not for data download. The application is configured for comports 1 to 30. My device connected at Com44. I had to get round this by forcing it to Com2 using the Device Manager in the Control Panel. 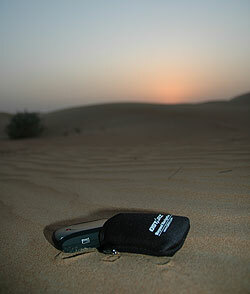 Note that the Baud rate must be set to 115200 or the application will not see the GPS datalogger. When you have made the connection select the data log list option and quickly click the "Stop Log" button. If you are lucky you will do this before the GPS gets a fix and logs a trackpoint at your current location. There are no facilities to to edit or truncate the log file. The next action is to hit Download. This may take a while if you have a large track stored. When the device was about 65% full it took over 5 minutes to download. Don't worry though you get a progress meter so you can see it working. I always save the data now. You can save it in a number of formats: CSV, KML (for Google Earth) or NMA. I always save it in CSV and NMA formats. If you want to reload it into the TravelRecorder application it must be saved as CSV. The position data will be displayed in the spreadsheet style panel where you can scroll down and examine the data. The data can now be displayed in Google Earth using the "Draw Map" button, but the selection criteria and display options are not user friendly. I find it easier to save the data as a KLM file and use that to launch Google Earth. The next step in the process is to match your pictures and the just saved tracklog. This is done using another application called Locr. 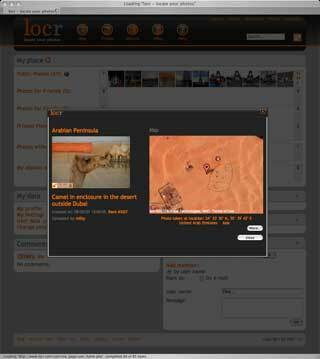 Locr is (currently) a free to use community site which provides an interface for you to upload you images to the website, and to set location details for them as well. 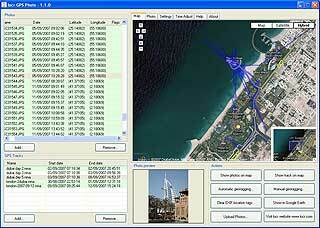 This is further enhanced by the locr GPS Photo application which matches a GPS track log with the image files. 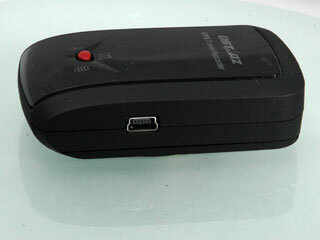 The locr GPS Photo application is bundled with the Qstarz Travel Recorder, but can be downloaded and used without a GPS track. One of the important panels here is the time adjust. This allows you to tune the difference in time between the camera setting and your computer. If this is wrong then it will not match up the image to the track log correctly. I found this out when trying to upload and locate my pictures in Dubai. The hotel PC I was using was obviously set for Dubai time. It took me quite a while to work out what was wrong. Anyway once that was sorted I was able to check that the pictures were in the correct locations simply by adding the photos from the cameras (yes I did take more than one) and then loading in the Qstarz track log. Pictures that had a matching location were highlighted in green. You can go and verify these picture locations simply by clicking on them. You need to be connected to the internet for this as it uses Google Maps to display the location. I like to use the hybrid option as this shows the road map overlaying satellite imagery. When you are happy with the positioning click on the "Automatic geotagging" button to add the location data to image file. Warning. This action changes the data in your picture files. It is advised that you perform this on copies of your pictures rather than the originals. I have had 2 occasions when the files have been corrupted during my testing. Now the location is embedded within the picture file you can use it in any application that uses the Location in the EXIF data. 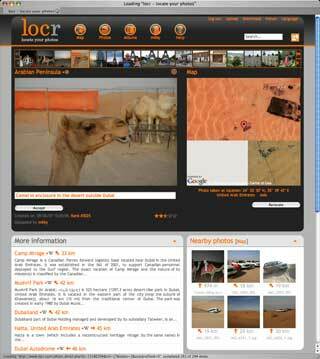 One such application is the locr website. When you upload the image it recognises that the location has been set and displays both the image and a map of the location. There have been a couple of occasions when for some unknown reason a track was not recorded correctly and didn't match my photos up. I was certain that I had waited until I had a GPS fix before taking the pictures. I also managed to get the locr to fail when reading some image files, I never managed to identify what the cause was as the image files all displayed fine on the PC. Click here see a selection of my images that were geo-referenced using this system. I have been testing this system now for a few months and have found that apart from a couple of glitches (possibly user error) the whole system works very well. It is a wonderful way to help organise your images in a slightly different way to normal, and will become a standard tool in my photobag from now on. It is still not ideal, as I would like the whole operation to occur within a single application.